Bill Williamson (Bill “Bojangles” Robinson) is a successful dancer – so successful that he has landed on the cover of Theatre World magazine. When he sees the magazine, he begins to reminisce, with the film flashing back to his days as a fledgling performer. After returning from World War I, Bill met a beautiful singer named Selina (Lena Horne) at a soldiers’ ball. Through flashbacks, Bill is shown at the ball, promising Selina that when he makes something of himself he’ll return, so they can be together. Years pass, and their rising careers are shown. Eventually their paths intersect again, but Selina has become so wrapped up in the entertainment world that she is unwilling to settle down and marry Bill. Will she change her mind, leaving show biz to live a happy and fulfilled family life with Bill, or will she stay focused on her career? 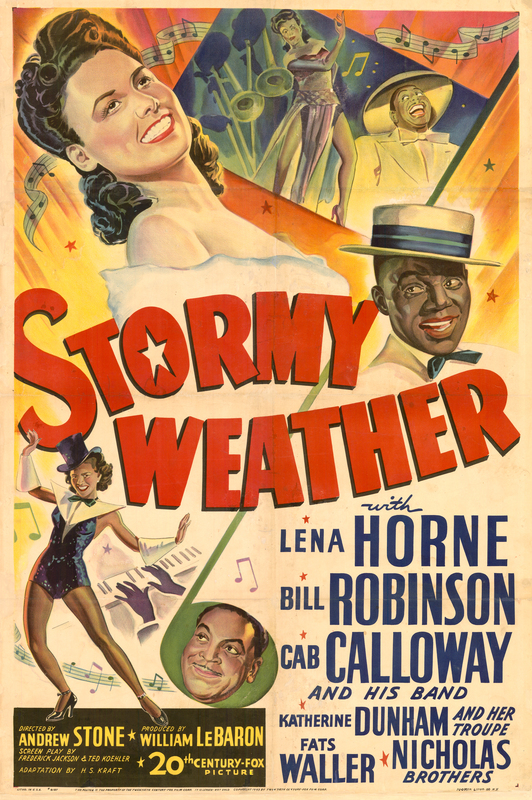 Andrew L. Stone directs the 20th Century Fox musical Stormy Weather, which is partially based on Bill Robinson’s life as a performer as well as a story by Jerry Horwin and Seymour B. Robinson. The film was released theatrically in November of 1943. It was Robinson’s final film. 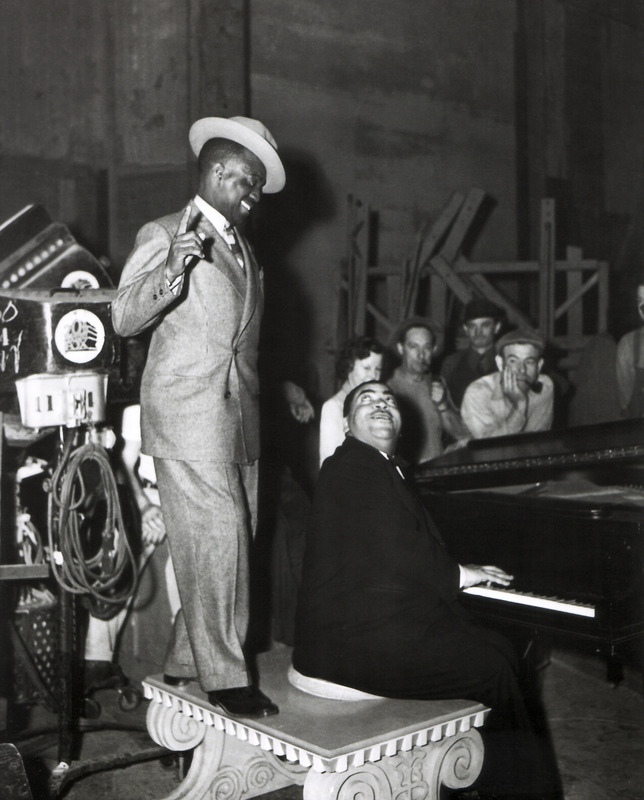 Alongside Robinson and Horne, the film showcases a top-notch cast of African-American performers including Cab Calloway, Fats Waller, the fantastic Nicholas Brothers and Dooley Wilson. Despite its relatively short running time, Stormy Weather packs in around 20 musical numbers. My personal favorites include “There’s No Two Ways About Love,” which is performed once by Lena Horne and again by Bill Robinson with Cab Calloway and his orchestra; the film’s title song, “Stormy Weather,” performed by Horne (of course); “Ain’t Misbehavin’,” performed by Fats Waller; and “Jumpin’ Jive,” performed by the Nicholas Brothers. The story suffers a bit as a result of all of that song and dance, because the already simple premise is reduced to bare scenes that take a back seat to the musical numbers. Like quite a few musicals of this era, the film is focused on the entertainment industry, and so the performances are the most important element. There’s not much in the way of production values here, either, to beef up the story: no crafty angles or striking cinematographic elements to heighten the story’s emotions. There are a number of humorous moments to keep the viewer occupied, but in general the real draw here is the music. The song and dance numbers alone make the film well worth watching, thanks in large part to the phenomenal cast. Many of the performers in this film have, unfortunately, become near-forgotten outside the realm of mid-20th century entertainment fanatics such as myself. Lena Horne and the Nicholas Brothers stand out as the most captivating. Lena is lovely, sounds as beautiful as ever and has great screen presence, making this a must-watch for anyone who is a fan of her. And what is there to say about the uber-talented Nicholas Brothers? Classic film fans will recognize them from The Pirate, a film in which Gene Kelly fought for them to appear. Their “Jumpin’ Jive” tap scene is one of Stormy Weather‘s greatest highlights. The scene was shot in one take and was reportedly one of Fred Astaire’s favorite-ever movie musical numbers. Next Next post: Happy birthday, Joan Blondell!